The tape reveals a rare glimpse into the Machiavellian mind of the man who has single-handedly won the War on Terror, slashed Hospital waiting times and endeared himself to millions of eco-friendly Brits by his popular ban on fox hunting. GORDON: "So I'm the president of bleeding France now, am I? Well it's not quite what I was after, I was hoping for something a bit closer to home." TONY: “That’s really not the point, Gordon. Look the point is, the point is — um, we have decided to rename the ‘War on Terror’™. It’s that word — war. You see, it just has certain, er, connotations. Frankly I'm not too keen on 'Terror', either.."
TONY: “Yes, connotations. Well, anyway, we have decided to re-brand the war as the ‘Campaign for Organised Calm & Ushering Peace. COC-UP for short." 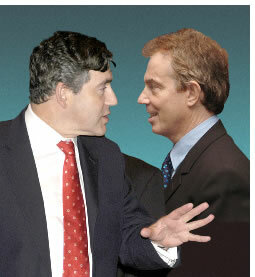 TONY: “Stop being so bloody negative, Gordon. We’ve done the research — we know what we're doing." GORDON: (suddenly perking up) “Yes, Yes, oh Yes!" TONY: “Er, hmm, No, er — I'm really not sure I can recall ever having.. look, would you hang on a minute, my special red light's flashing? Look, sorry Gordon, I’ve got George W on the other line. I’ve really got to go."